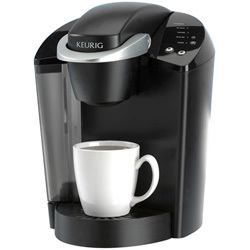 We have a large Keurig at the office and I have a smaller one at home. This thing is the best invention ever! I love, love, love how I can brew what I like and then the person behind me can brew what they like and it only takes a minute to have the perfect drink. We have one guy that likes his coffee so strong that it could lift his car. I like mine so weak it doesn’t even look brown. And we can both be happy in the space of three minutes. I adore the teas, hot as well as iced. I have run the same K-cup through the mahine 5 times to get a partial pitcher of iced tea. Fill the rest of the pitcher with cold water and you’re set. I like the raspberry. The best hot drink I’ve found is the Chai tea. I am not a fan of sweet drinks and both the raspberry and the chai are not too sweet. They need no additives. Of course, you sugar junkies can add all you want. I’ll pass. One of the other women at the office brought in iced coffee K-cups last week, I haven’t tried one yet but everyone is raving about how wonderful it is. Memo to self: drink some before it goes the way of the dodo bird. Like tomorrow. Anyway, I recommend this baby for anyone who likes liquid. Two thumbs way up!